On Foot in Spain's newest Camino-based itinerary following the culturally-rich Via de la Plata from Sevilla to Santiago de Compostela. There are some people you never forget! Virginia and George Havens traveled with us 12 years ago in May 2003 along the Camino de Santiago. 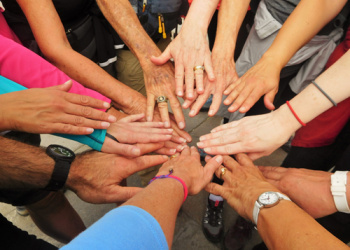 They formed part of a special group that came together as strangers and ended up sharing many wonderful moments and developing friendships that still endure today. I have a photo of that memorable group taken at the Camino’s literal high point – la Cruz de Ferro (the Iron Cross). Looking at each face brings back a flood of memories. Some of them went on to travel with us two or even three times. Others we have kept in touch with via email and holiday cards. One such special couple is Virginia and George. At the time they were a spry 78 and 79 and they are still going strong! Jose and I fondly remember how beautiful Ginnie was always lovingly cared for by George. Ginnie’s a birder and I can still remember hearing about her work with birds and building birdhouses. As we walked she’d point out birds I couldn’t even see. Many times over the years I have wished she were along on other walks to keep teaching me! On that trip we also discovered that Ginnie and I and another woman on the trip, Nancy Grandfield, are all Kappa Kappa Gamma sisters. That was a great coincidence! At the end of walk, during our final dinner at the Parador in Santiago de Compostela, George got up, ordered champagne for the group and gave a very special and meaningful toast! What a couple! Her latest [class] was Sports History which required writing a short paper on an object related to some athletic activity (baseball bat, football, etc.). Ginnie chose her scallop shell and we thought you would enjoy seeing her report to which she attached a copy of the Camino certificate that you gave us. We did enjoy seeing her report and asked if we could have permission to publish it here with a photo of Ginnie. We hope you enjoy this as much as we did! We greatly enjoy seeing how the Camino continues to evolve in people’s lives and can inspire projects such as these 12 years later! Buen Camino, Ginnie and George! The symbol that evokes memories of achievement, endurance and adventure is the white scallop shell hanging on a cord at my desk. This type of shell was first worn on the hat of St. James, patron warrior saint of Spain, and today it signifies a completed pilgrimage walk on the Camino de Santiago across Spain. First, a brief history of St. James, a disciple of Jesus, and this 500-mile trek to Santiago de Compostela in northwest Spain. James came to Spain shortly after the crucifixion to spread Christianity. On returning to Jerusalem, he was beheaded by Herod and his body sent in a casket by the other disciples back to Spain for burial. After some 800 years, the burial spot was forgotten and unknown, but on a certain night the field was illuminated by the stars and with this guidance the burial casket of St. James was unearthed and discovered. This startling discovery resulted in a sacred pilgrimage to this holy site that drew pilgrims from all over Europe. The Camino starts in eastern Spain in the Pyrenees Mountains that separate France and Spain. It descends through Roncesvalles (a historic location where Charlemagne once fought the infidel Moors) then on to Pamplona. Logrono, Burgos, Leon, Bierzo, Arzua to Santiago to be blessed in the great cathedral there. In the middle ages, pilgrims walked the 500 miles across Spain seeking redemption and a spiritual encounter with St. James, and receiving forgiveness for their sins. This walk along this ancient road became a venerated tradition and Santiago became a popular pilgrimage destination. Last year over a million individuals were reported to have traversed the Camino and then received the scallop shell to reward and verify their experience. In my years of reading I would come across references to this famous “road” and I would think “Oh the experience of walking it...walking, thinking a and meditating” with all of Spain stretching out before me, all open, no restrictions, no time table...just me and the world. In 2003 my husband and I decided to tackle the Camino, at least a part of it. We would do 100 miles in 12 days in an arrangement that extended across the entire road, but avoided the less interesting parts. It was for me a magnificent experience and the shell recreates memories of golden wheat fields filled with red poppies, impressive ancient buildings, bridges and churches, warm and kind mountain people, owls and great beech trees and exotic foods. And then the memory of walking 8 to 10 miles each day on weary, weary feet, then the last demanding push for 12 miles up an almost unending mountainside on a never-to-be-forgotten day. What are the lasting, indelible effects of such an experience? First of all, I am always aware of having the gumption to do such a trek at a senior age. Then having the courage to cross the ocean, plant my feet on strange soil and move out on a 100-mile effort, and accomplish it. It was a singular decision in my life – that produced a bold, unique and highly satisfying experience that confirmed my commitment to an adventurous life. It reinforced my love and appreciation for Spain. It left me with regrets that we were not able to do the tough trek to the Everest base camp at 18,000 feet in Nepal (which we had planned) and on to the Antarctic in the footsteps of Shackleton. One of my favorite objects on display in Santiago de Compostela's Museo de las Peregrinaciones (Pilgrimages Museum) is this scallop shell dated to before 1120. Identified as "Vieira de peregrino (Pectem maximus) " (Pilgrim's Scallop) the room text tells us it: "was found in a burial place in a plot that was later occupied by the north central nave of the Romanesque cathedral of Santiago. Therefore, it is prior to 1120. The scallop shell is the symbol of the pilgrimage to Santiago, taken by pilgrims on their way back home to the most remote places in Europe." We are looking at the oldest known scallop shell used by a pilgrim to the shrine of St James in Santiago de Compostela.